A Belleville homeowner searched for and selected each treasured piece that, when mixed together, makes her house a home. The foyer's show-stopping piece is the Chapman ram's horn chadelier from the 1960s. The homeowner found the dining room chairs at an estate sale. 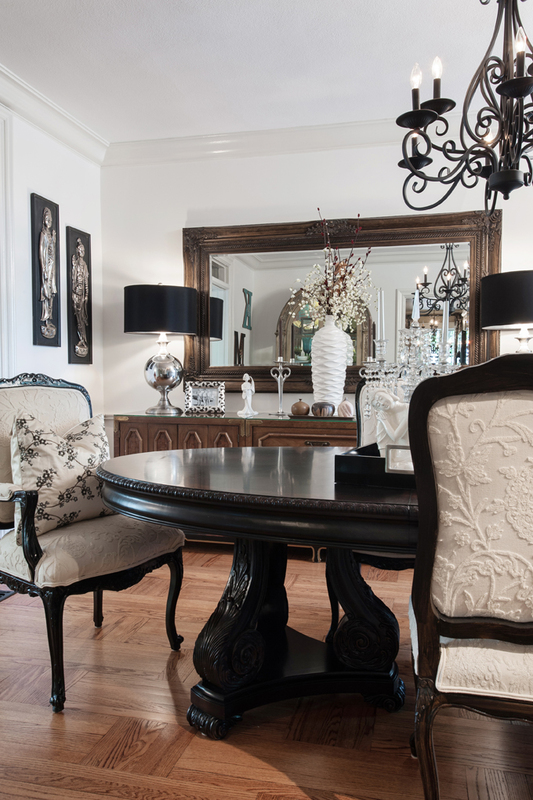 The upholstery is original and the frames were stained ebony to match the dining room table. A piecrust table is tucked into the breakfast area adjoined to the kitchen. The great room was added on by the previous homeowners. Starting with a fresh, white slate, the homeowner added a Moroccan and Bohemian touch to the space. The two-story English Tudor tucked away in a private, quaint neighborhood in Belleville tortured her every time she drove by it. She had fawned over the home for two years, but finally, in 2013, the house was for sale, and this design-savvy homeowner was able to purchase it and make it her own. The charm of the architectural elements combined with the open layout and large room sizes were what Kelly, the homeowner, and her partner Steve pined for. The previous owners of the home had lived there for 40 years. While in good condition, the new homeowners wanted to put their own mark on the 1928 residence. But before Kelly could give it her signature touch, structural and cosmetic changes had to be made. Major repairs were needed in the basement, where a kitchen was removed and a dated bathroom was given a much-needed update. On the second story, two bedrooms and a Jack-and-Jill bathroom were demolished creating a hallway, common bath and mother-in-law suite. The previous configuration required you to go through the original third bedroom in order to access a hallway that led to the fourth and fifth bedrooms. While the layout worked for the previous owners, the current couple wanted to make the space more functional for their family. The right piece is one that moves her or makes her stop in her tracks when she sees it. She is constantly scouring local antique stores, consignment shops and furniture stores in Illinois and St. Louis. A few of her favorites include Halbert Rugs, The Future Antiques, Shelton Davis Antiques and Tuesday Morning in St. Louis and Consign & Design and the Ginger Shop in O’Fallon, IL. “I look everywhere, and I drive myself insane sometimes,” she jokes. 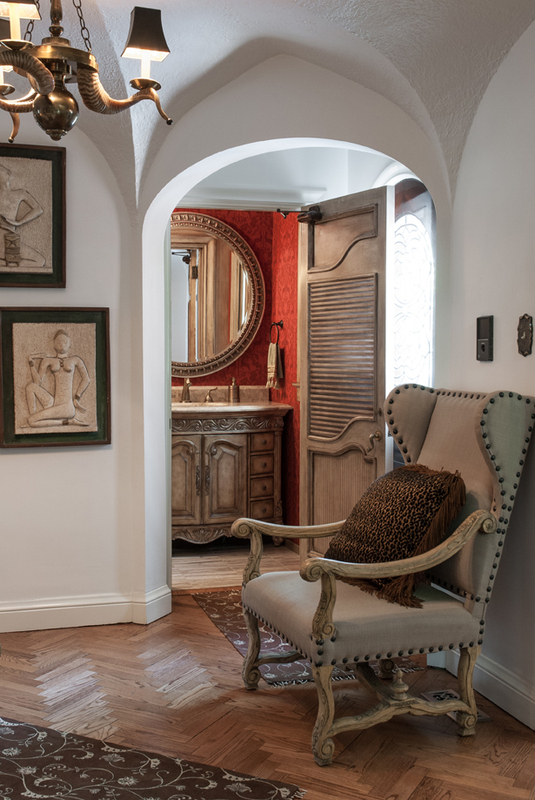 Entering through the arched front doorway, the foyer’s show-stopping piece is the Chapman ram’s horn chandelier from the 1960s that is original to the home. 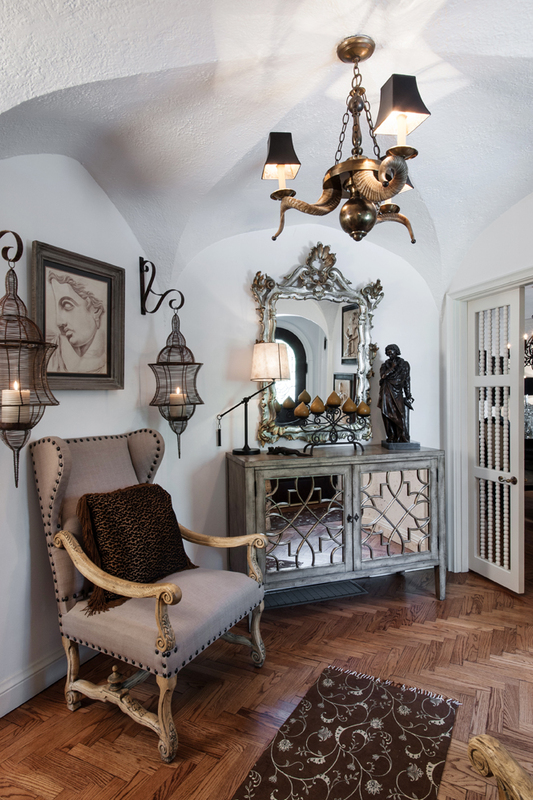 The fixture sets the tone for the eclectic mix of furnishings in the entry. 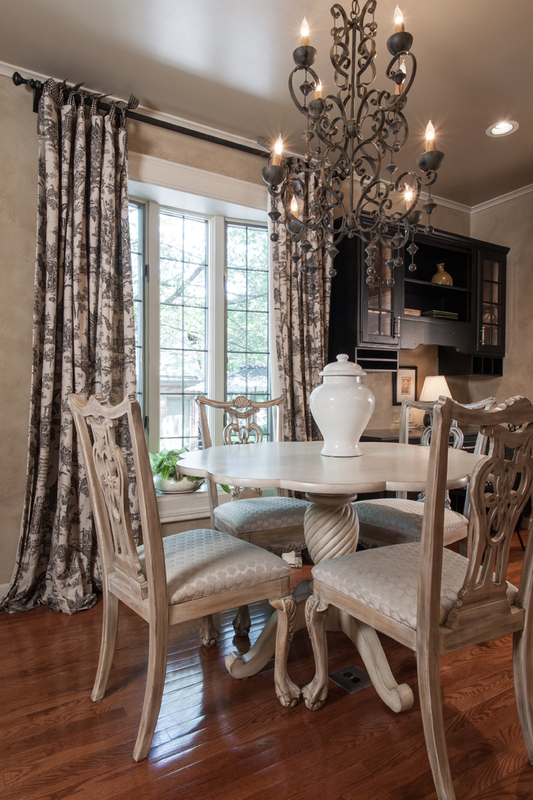 Matching wingback chairs are covered in a neutral fabric while nailhead trim and wood arms and legs add detail. A pair of wire lanterns is hung on wrought-iron brackets providing a touch of whimsy. A mirrored chest stores entertaining essentials. The herringbone floor leads you through the double doors into the dining room. Wooden beaded panels allow light from the foyer to spill into the dining room. Just off the dining room, the kitchen continues the neutral color scheme of the dining room. The current owners have not made any major changes to the kitchen. The French country style with cream cabinets works with the home. A breakfast area is perfectly tucked into the kitchen bay window where the homeowners enjoy a morning cup of coffee at the piecrust table. A small window opening above the sink offers a peek into the great room. 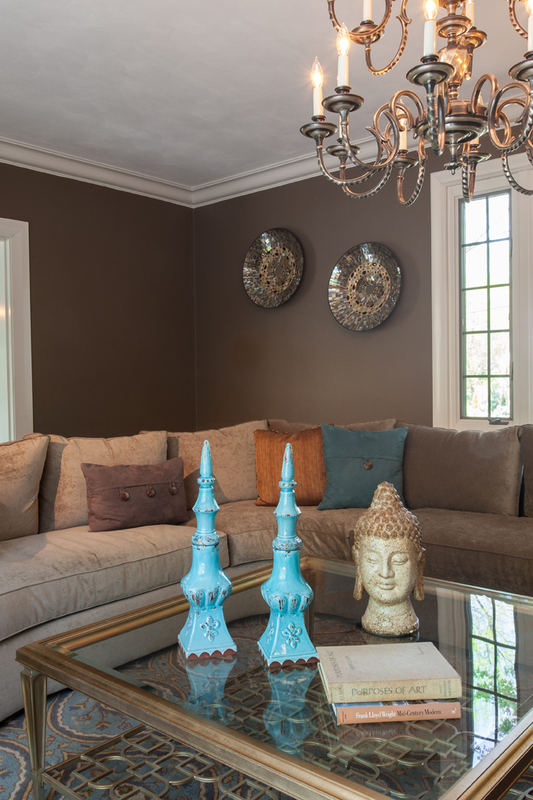 In the front of the home, the living room incorporates splashes of Asian décor as evidenced by the accent pieces on the square glass coffee table. Cocoa brown walls set a dramatic tone. The mocha-mink sectional is perfectly softened against the wall color. 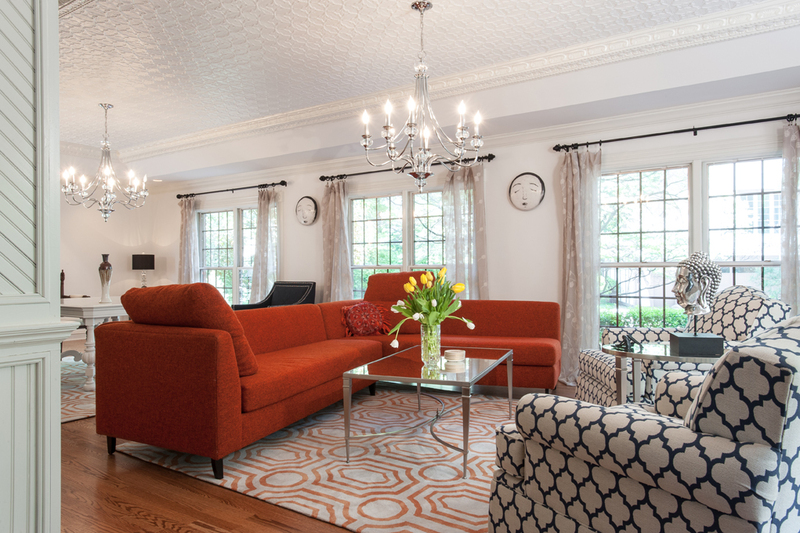 The showpiece in the living room is a double hanging light fixture the homeowner salvaged from a 100-year-old home. Each piece was carefully welded and soldered together. Just off the living room, a bonus sunroom provides beautiful views of the garden and golf course. The space was previously an open-air porch that was enclosed. 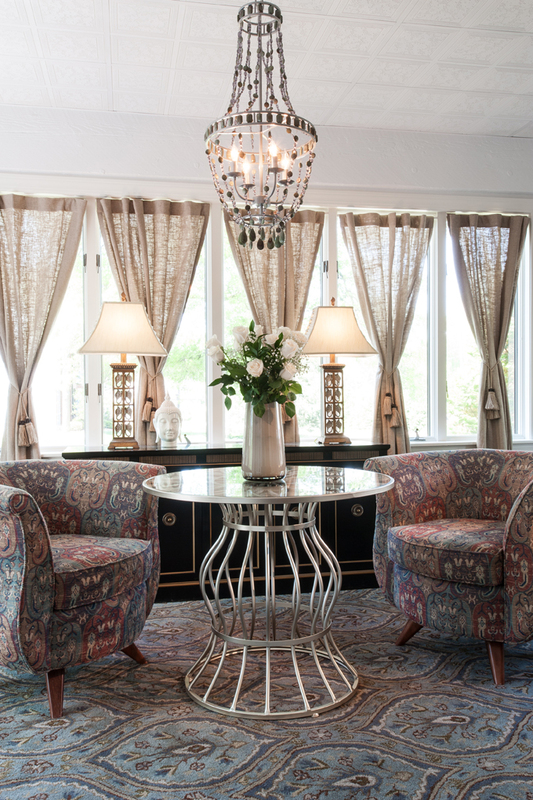 Two Carter custom chairs found in St. Charles create a quite conversation area. Just behind the chairs, a Drexel buffet from the 1950s or 1960s is another classic find by the homeowner. The second floor of the home includes three bedrooms plus a mother-in-law suite. The homeowner wanted to create a touch of glamour in one of the guest rooms with a Henredon canopy set refurbished and topped with fabric swags delicately hang from the canopy adding romantic charm. The master suite features beautiful built-in cabinetry for storage. Previously a mirrored, marbled gold, the homeowners painted the cabinetry white and had all of the hardware bronzed for an updated look. An upholstered bed frame brings a soft touch, while the mirrored nightstand from Shelton Davis Antiques enhances the style and glamour. Proving that style and design don’t have to come from one place, this Belleville homeowner has made her mark on her classic residence. With an open mind and pages of inspiration, Kelly has pieced together her personal perfection.